A major wintry blast is pounding the Midwest and the Great Lakes region. A powerful winter storm is moving eastward across the Great Lakes today, bringing with it potential heavy snow and strong winds all the way to New York. Winter storm and lake-effect snow warnings stretch from northern Michigan into upstate New York and Vermont, as the first major wintry blast of the season pummels the United States. Snow is already falling rapidly in some parts of the Midwest, and the blizzard-like conditions have been blamed for at least three deaths. (ABC News) The winter storm was located over the northern Great Lakes early Saturday morning and is moving eastward. Forecasters expect the heaviest accumulations of snow to pile up in the eastern Great Lakes snow belt and the Adirondacks in New York this weekend through Monday night. (ABC News) Snowfall of up to 2 feet is expected to accumulate in some areas through Sunday night. In northern Minnesota, 10 to 18 inches of snow has fallen across much of the region and there were reports of up to 2 feet of snow in some areas. Over 20,000 homes and businesses were reported to be without power in Minnesota on Friday night due to blizzard-like conditions. 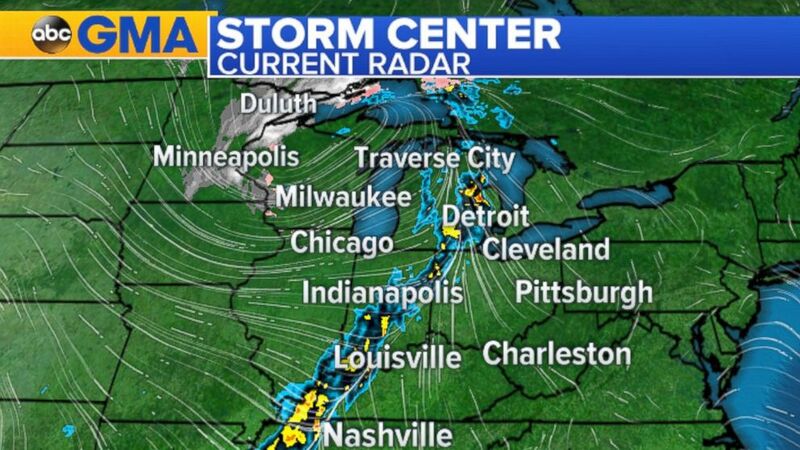 Wind gusts up to 70 mph were reported from Minnesota to Michigan, according to ABC News senior meteorologist Daniel Manzo. (Dave Schwarz/ST. Cloud Times via AP) A man walks in the snow near the entrance to the St. Cloud Public Library, Nov. 18, 2016 in St. Cloud, Minnesota. The Minnesota State Patrol reported hundreds of crashes, dozens of injuries and at least three deaths as the snowstorm swept across the Midwestern state. The worst of the storm has since moved out of that area, and less-than-stellar conditions are expected further east. "By late Saturday night and into Sunday, we will be seeing widespread lake-effect snow through the western Appalachians and into interior parts of the Northeast," Manzo said. "The big question is how much snow will make it down to the major cities." 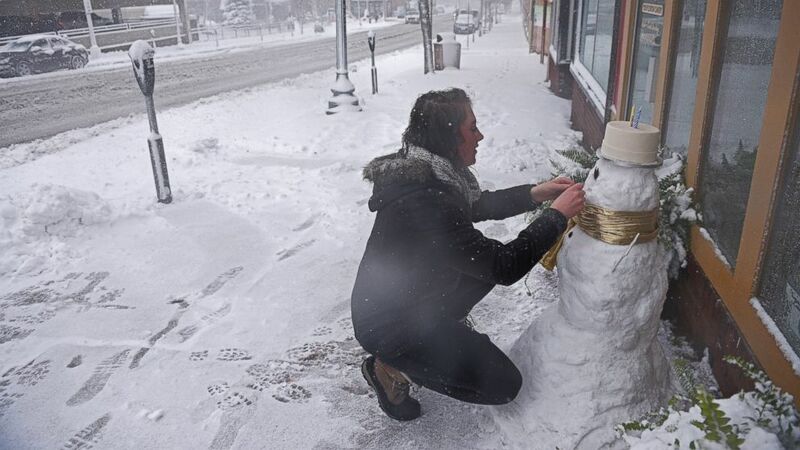 (The Argus Leader via AP) Cassie Maurer, with QT Cakes, puts the finishing touches on a snow man in front of the shop during a snow storm, Nov. 18, 2016, in Sioux Falls, South Dakota. 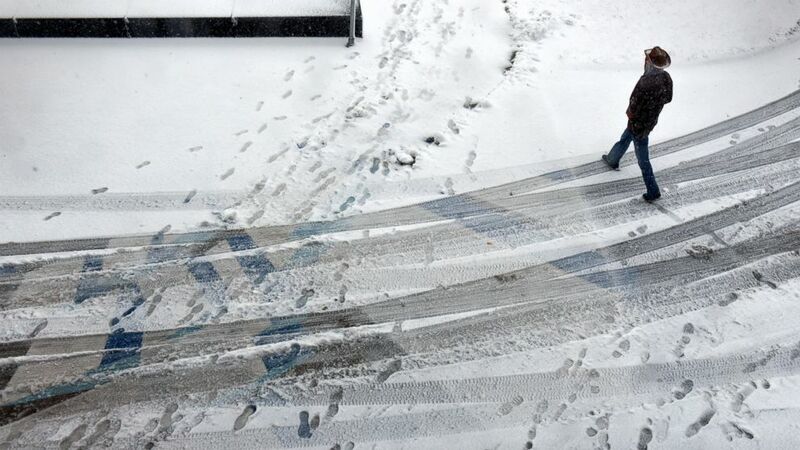 Parts of interior New York could see upwards of 10 to 20 inches of snow in areas where it’s falling persistently. And widespread regions of upstate New York could receive 12 to 18 inches, according to Manzo. 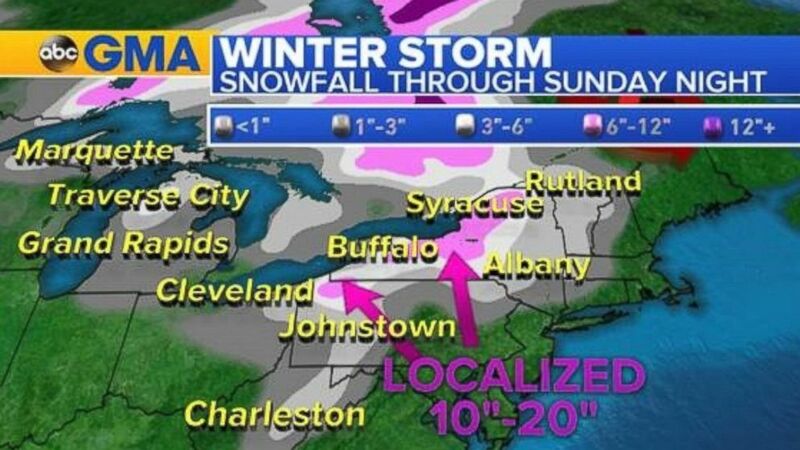 “Maybe some flurries make it to New York City on Sunday night -- it is possible,” Manzo added. 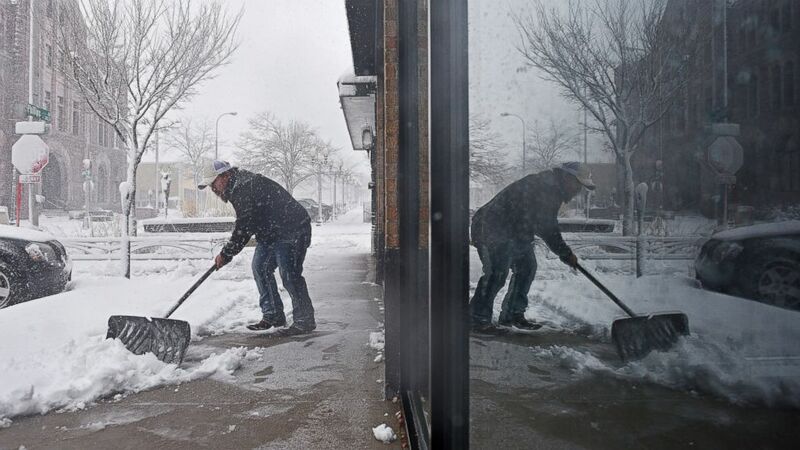 (Joe Ahlquist/The Argus Leader via AP) Philip Peter shovels snow in front of the restaurant during a snow storm, Nov. 18, 2016, in Sioux Falls, South Dakota. There were also reports of residents digging out after snow piled up in parts of Nebraska and the Dakotas earlier this week.